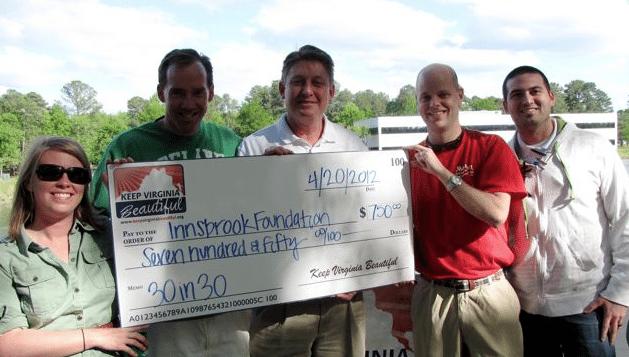 Innsbrook Rocks a 30 in 30 Grant! The Innsbrook Foundation and the Go Green Committee have been awarded a $750 grant in the Litter Category. The KVB 30 in 30 grant program focuses greater resources and attention on organizations and individual localities throughout the Commonwealth and how they are addressing the issues of litter prevention, recycling, waste reduction, beautification and education. These grants are made possible by KVB partners – Capital One, Waste Management and Lowe’s. The Innsbrook Foundation’s Go Green Committee plans to use the Cigarette Prevention grant to reduce litter at all Innsbrook events including (and most importantly) the Innsbrook After Hours Concert Series. The Foundation wants this year to be the year that they give something back to the community, and specifically, the natural area where the venue exists. The grounds currently do not have any cigarette litter receptacles, educational signage, or portable ash trays. This grant will not only provide designated smoking areas at the concerts, but more importantly, it will provide the educational tools to concert goers to help protect our natural and scenic environment. Additionally, The Innsbrook Foundation will encourage all concert attendees to sign the Clean Concert Pledge (www.cleanconcert.org), which promotes education on the cycle of disposal. We RECYCLE those Cigarette Butts!